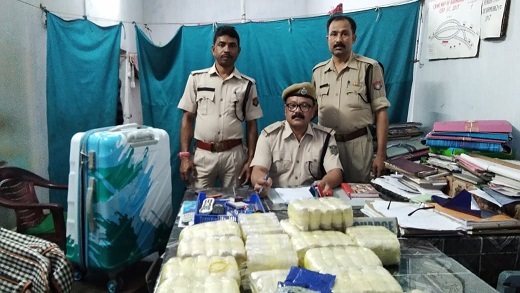 During a regular checking in a Silchar-Agartala passenger train, the Karimganj Railway Police was able to seize drugs in the form of tablets worth Rs 14 crore at Karimganj Railway Station on Tuesday. According to information, the drugs were found in two bags during a routine checking in the train. Sources said, as soon as the Agartala-bound passenger train coming from Silcharhalted at Karimganj station in the morning on Tuesday, a team of Karimganj Railway Police, led by Sub-Inspector Benudhar Medhi, started checking each of the bogies of the train. During the routine checking, the railway police personnel found an unclaimed bag. When checked, the railway police personnel discovered two bags inside the huge bag. In the bags there were 140 packets containing 2,80,000 intoxicating (WY) tablets. The railway police suspect that the intoxicating tablets might have smuggled from Myanmar to Manipur and then from Silchar, it was supposed to be transported to Agartala from where the consignment might have smuggled to Bangladesh. Railway police have already started investigation into the case but they are yet to arrest anyone in connection with the case. It may be mentioned that the Border Security Force (BSF) troops of 74 battalion and 145 battalion recently seized 6,850 numbers of Yaba tablets worth Rs 34,25,000 during two different operations along the India-Bangladesh international border in Tripura. The first drive was conducted on specific information of the intelligence cell of BSF, in area of responsibility of BOP Ashabari, 74 Bn BSF by putting special ambush near village Rahimpur. In an another joint operation, on specific information, troops of BOP NC Nagar, 145 Bn BSF and staff of Sonamura police station, laid ambush in the suspected area.